Keep updated on recent news and changes in our clinic. The PHI (Private Health Insurance) Reforms on Pilates – How this affects our clients. In 2018, the Federal Government announced its plans to make certain natural therapies ineligible for private health insurance (PHI) rebates. Among these was Pilates. The Government’s original position was that Pilates would not be rebatable, regardless of who delivers it or how it is delivered. However the Department considers that an insurer may lawfully pay benefits if a physiotherapist, providing services to a patient within the accepted scope of clinical practice, uses exercises or techniques drawn from Pilates as part of that patient’s treatment, as long as the exercises or techniques are within the accepted scope of clinical practice. As long as the group exercise class is performed within the scope of physiotherapy, it does not need to change. It should be underpinned by individualised assessment, treatment and follow-up, and backed by thorough notes. The Department and private health insurers agree that physiotherapy is physiotherapy, and therefore fundable through private health insurance. These changes are to take place as of 1st April, 2019. For more information from the Department of Health in regards to these reforms, please click here. For more information from the Australian Physiotherapy Associate regarding these reforms, please click here. How does this affect clients of Body Mind Wellness Physiocare? Our classes will now be referred to as Group Physio Rehab Sessions, with the subtitle being, Core Strengthening and Stretching Class (CSSC). Each client is prescribed an individualised program which will be covered in the Physio Group Rehab Session. Each client will have their own modifications and elements to focus on. At Body Mind Wellness Physiocare have always conducted Initial Assessments to formulate individualised client treatment plans and backed this up with our clinical notes. However to assist us to comply with the new legislation, we are asking that if you have not had an assessment in the last 8 weeks, that you schedule an individual assessment with Marika prior to April 1st, 2019. This will ensure we have an updated physical assessment with patient specific goals. We have also asked all of you to complete a Patient-Specific Functional Questionnaire which will tie in your goals and help us to assess and document your improvements as a result of your participation in our Group Physio Rehab Sessions/Classes. Historically, my classes have always been conducted based on a combination of my physiotherapy knowledge and expertise, my Pilates training and my understanding and awareness of each client’s individual conditions and goals. Small groups, individual modifications and individual guidance have always been key features of my classes. These aspects and features will continue under the Physio Group Rehab Sessions or CSS Classes. A review assessment will be required every 3 months, if not before, depending on the client’s needs, to reassess client outcomes and formulate/address any new goals. Our Physio Group Rehab Sessions or CSS Classes continue to be claimable under the code 560 with the new PHI Reform, and after April 1st, 2019. If you are not prepared to participate in completing the above requirements you CAN still attend the classes, however, you will NOT be able to claim under your Private Health Insurance. Our Group Physio Rehab Sessions/Classes will continue to be held at the following times…. The Pricing structure of our Group Physio Rehab Sessions/Classes is as follows…..
$24.50 with purchase of a Ten Session Block ($245). Each client is prescribed an Individualised program which will be covered in the Physio Group Rehab Session. Each client will have their own modifications and elements of focus. Our Physio Group Rehab Sessions or CSS Classes continue to be claimable under the code 560 under the new PHI Reform, after April 1st, 2019. Same Pricing Structure – $30 per class OR $24.50 with purchase of a Ten Session Block ($245). I look forward to continue working with you on your health goals in 2019. Should you require any further clarification, please do not hesitate to email me directly at marika@bmwphysio.com.au. Awesome Archie Arch Support Thongs! As the warmer weather approaches, we at Body Mind Wellness Physiocare thought it would be a great time to let you know about a fantastic new summer product we have come across that you may benefit from! The new product is called, “Archie’s Arch Support Thongs” and they are an orthotic thong that were designed by a young private practice Physiotherapist who was sick and tired of telling his patients to stop wearing flat thongs (Does this sound familiar?). 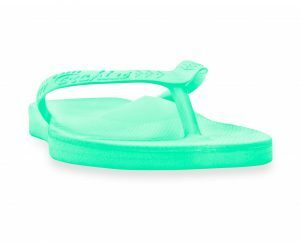 While the concept of orthotic thongs is not new, this design varies greatly from anything we have ever seen before as they incorporate legitimate orthotic support but still just look like normal thongs! At the start of every summer there seems to be some form of article in the newspaper or a T.V interview about the negative effects of flat thong wearing, in fact it has been well reported in recent times that there are many elite sports teams which have actually banned their athletes from wearing flat thongs! 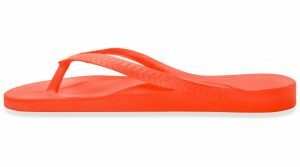 While we are all reasonably aware that flat thongs are not great for your feet, what’s actually wrong with normal thongs? Pronation occurs when the foot rolls inwards. When the foot rolls in so too does the lower limb/leg, causing a disruption to the body’s natural alignment. Increased pronation alters the way that stress and strain are absorbed through the body, which can potentially lead to injury. Issues arising from increased pronation are more common in people with flat feet, however it can occur in all foot types. Flat thongs can also be problematic for people with high arches. People with high arches have a tendency to take increased stress on the outside of the foot and leg which over time may lead to injury. The addition of arch support in this foot type can help more evenly distribute the load and pressure across the foot which may potentially reduce the likelihood of an injury from occurring. One of the other biggest problems with typical thongs is that they often come with a very loose strap. Normally when you walk your toes are supposed to bend upwards which activates the arch of the foot which then provides protection and support to the vital structures of the feet. However, most typical thongs have a very loose strap which means that you end up clawing / scrunching your toes down just to try and keep the thongs on your feet. When the toes claw / scrunch down rather than bending up, the arch does not activate and as a result your foot is subject to increased stress and strain which may lead to damage of some of the vital structures of the feet such as the plantar fascia and joint cartilage of the bones of the feet. Archies Thongs have been designed with a much tighter strap than normal thongs which reduces toe clawing and enhances proper foot function which allows you to walk more naturally. Most thongs are also very flat in the heel section with little to no elevation which can put a lot of stress and strain on the calf and achilles. The lower your heel is to the ground, the more your Achilles will be on constant stretch, this can predispose to problems such as Achilles tendinopathy. When the heel is elevated the Achilles is unloaded, thereby providing your achilles tendon with some relief from constant stress. 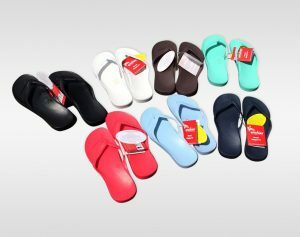 Other more obvious problems with typical thongs is that they are commonly have straps that are made out of hard plastic which can cause irritation and can potentially lead to blisters. These straps also often break at the toe pole by having the plug pull through the base of the thong, splitting the thong in the process. Archies Arch Support thongs have done a brilliant job on solving these issues and they have already been adopted by many professional athletes, sporting teams as well being stock in the clinics of some of Australia’s leading Health Professionals. Apart from solving these key design issues already mentioned, Archies Thongs are well and truly the most comfortable thong we have ever worn and once you get used to them you will not want to take them off! In fact, even if you don’t normally wear thongs, Archies Thongs are great to be worn as an in and around the house slipper, especially if you wear orthotics or other supportive footwear. This is because often we go from wearing our supportive footwear or orthotics through the day and then come home and walk around in bare feet on hard floorboards and tiles. 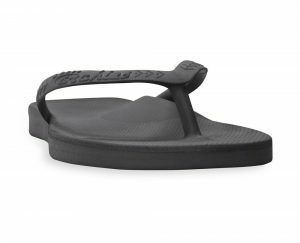 The super comfortable soft foam and the arch support found in Archies Thongs is great to help to take some off the stress and strain when walking around on hard tiles and floorboards. In particular, the thongs are great for any of our patients suffering from plantar fasciitis to support and protect the arch while it is healing. In this case, we suggest to put your Archies on before you even take your first step in the morning, having the arch may help to- reduce pain and facilitate a more optimal healing environment. Anyway, I think that just about covers it. 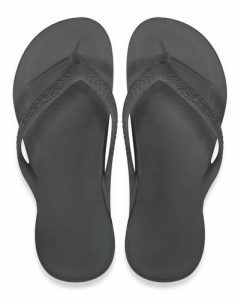 We all know that people are going to wear thongs in Summer, it’s the Australian way! However we think that Archies Thongs will certainly be a more suitable alternative for you than wearing flat thongs. At a retail price $35.00 Archies Thongs represent excellent value for money and are a good investment in your health for the upcoming summer! To encourage all our Adelaide customers to invest in a pair we are offering them at $30 for February, March and April 2019! We are proud to offer a wide range of comprehensive services to meet the needs of patients of all ages. Physiotherapist, Marika Scicluna, specialises in providing personalised Physiotherapy care, Rehabilitative Pilates, Acupuncture and Manual Therapy. Body Mind Wellness Physiocare embodies holistic preventative physiotherapy care. Our philosophy is that each part of the body and the mind are interconnected. Our goal is to help you find the best version of YOU attainable with this holistic approach. We believe in finding the balance in you to unlock your ultimate state of body and mind wellness.